Strange Ceres: New work suggests that surprising carbonate salts put the shine in the bright spots on the dwarf planet's Occator crater. 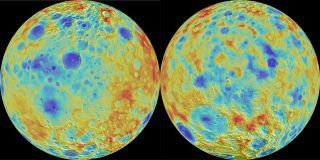 Researchers also found that Ceres' topography, pictured here, is only consistent with a subsurface less than 30-40 percent ice by volume. It's a case of mistaken identity: The mysterious bright spots on the surface of the dwarf planet Ceres were thought to be composed of hydrated magnesium sulfate (similar to the magnesium sulfate sold as Epsom salt), but new work reveals a different chemical signature in these bright dots, cooked up in watery conditions beneath its crust. And the revelations don't end there: Another research paper, also published today (June 29), suggests that Ceres' deep craters and jagged mountain mean the crust is mostly rock, rather than mostly ice as previously proposed. Ceres resides in the asteroid belt, but it dwarfs the other asteroids there at 590 miles (950 kilometers) wide and is an even sphere; it even takes up an estimated third of all the asteroid belt's mass, researchers said. Reserachers believe it could be a planetary embryo — a protoplanet that would have eventually turned into a planet like Earth or Mars under different circumstances. It is the only dwarf planet found closer in than the Kuiper belt, on the solar system's outer edges with Pluto. The bottom of Ceres' Occator crater shines with bright, reflective patches — the brightest region among those that puzzled and intrigued scientists as the Dawn spacecraft first approached Ceres and then entered orbit in 2015 (after orbiting another asteroid, Vesta, in 2011 and 2012). Eventually 130 bright patches were found on the dwarf planet's dark surface, mostly associated with craters. While researchers first suspected the bright spots might be ice, a closer look revealed they weren't quite that reflective and that they could be composed of salts instead. But the particular salt revealed in this study, published in Nature, by Dawn's Visible and Infrared Mapping Spectrometer would have formed in a process involving liquid water. "That was something we had not expected," Chris Russell, Dawn's principal investigator and planetary scientist at University of California, Los Angeles, told Space.com. "The carbonates are a very strong indication of the processes now that we believe took place in the interior, that makes it more Earthlike, when it can alter the chemistry inside." "It's not something that's just lying around out there in space," he added. Craters like Occator gave the lead author of the Nature Geoscience paper, Michael Bland, something to ponder as well. He calculated that if Ceres' subsurface was more than a certain percentage of ice, it would have a much more "relaxed" appearance, created as the ice warmed over time, instead of the harsh topography actually seen. Rather than a thick layer that's mostly made of ice, the researchers found, the dwarf planet's subsurface must be only 30-40 percent ice, mixed in with rock and a lower-density material, maybe hydrated salts. Measurements from Dawn are superimposed on a view of Ceres' Occator crater. The red indicates a high abundance of carbonates in the bright spots found there. The composition of the salts found in the crater's bright spots suggests that they formed with the help of liquid water, which would freeze in its pure form but could persist when mixed with salts, which slightly lowers its freezing point. (Water mixed with a different salt is proposed to flow on the surface of Mars.) On Ceres, that water would have emerged from deeper within the dwarf planet, where it could be warmer, or melted at the site of the impact that produced the Occator crater. "The composition that we found implied that liquid water was present sometime in the recent past of Ceres in the subsurface," Maria Cristina De Sanctis, lead author on the Nature paper and researcher at the Institute for Space Astrophysics and Planetology at the National Institute for Astrophysics in Rome, told Space.com. And the particular salt formed is sodium carbonate, a salt formed from carbon that, on Earth, usually forms as water evaporates from a body of water like a lake or in hot springs. The compounds have been detected off of Earth only in the plumes of material that burst out of Saturn's icy moon Enceladus (they also found ammonia-bearing salts in the mix, also found on Enceladus). "In the case of Ceres, we have a lot of carbonates — really a huge amount," De Sanctis said. "We did not expect to have such a huge amount of carbonates." Moving outward in the solar system, objects become colder and wetter, made more of ice than of rock. Ceres is rocky, but the composition of the salts, including ammonia-bearing salts which require super cold conditions to form, has more in common with those outer solar system bodies. That's a "strange connection" with the outer solar system, Mikhail Zolotov, a researcher at Arizona State University and author of a News & Views article on the new works, which appears in Nature Geoscience, told Space.com. "The chemistry is unusual, and it's key to understand how the body was formed and how it was evolved," he said. It raises the question, Zolotov and Russell both said, of whether the material that eventually formed Ceres might have migrated inward from the outer solar system at some point, or whether Ceres formed where it currently orbits. The story of Ceres' water is far from complete, as well — Russell mentioned that other papers from the Dawn team are in the works that describe how researchers can investigate water on the dwarf planet's surface. "Expect the water story to continue for some period of time, because there's a lot of different ways we can explore water." Going forward, the researchers said, they will have to check the composition of other bright spots on Ceres to see if the chemical process they've observed is restricted to certain regions or if it's more global. But regardless, the asteroid belt outcast continues to prove a complex, active world. "The IAU [International Astronomical Union] has defined what a planet is in a particular way," Russell said, "but I think of a planet more as a body which, when it's big enough and has enough activity … is now making things, producing things in its interior that are not just sitting there for the eons but in fact that the body evolves with time inside." The work in Nature about the bright spots' composition can be found here, and the work in Nature Geoscience about the subsurface composition can be found here.